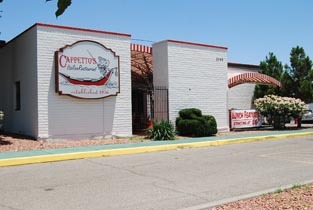 The Eastside Restaurant building is located 500 feet from the dynamic and booming intersection of Lee Trevino Drive and Trawood Street on El Paso's powerful East Side. Having served as an established Leo's Restaurant for over 15 years and Cappettos Restaurant, this beautiful and newly remodeled building has a huge enclosed patio, three seating sections, with an additional private party room in the back. There is a popular local bar area and a full functioning and established kitchen with walk in freezers and refrigerators. The current festive décor reflects a magnificent blend of this great Southwest area and the Italian motif required by the Lessee. A beautiful building housing a magnificent local institution, this Eastside Restaurant, makes for a wonderful business partnership.